When I was in Kansas in March my brother caught this 17 lb carp. It is a skin mount with a reproduction head, fins and gills. Nice work, I do believe that is the 1st carp I have seen mounted. Carp are getting some favorable press lately and some skilled anglers target them. It is a good thing that some species tolerate poor water quality that won't support other game fish. Carp may become more appreciated than in the past. I bet that skin mount was hard work, as carp are fatty and I would guess challenging to work with. 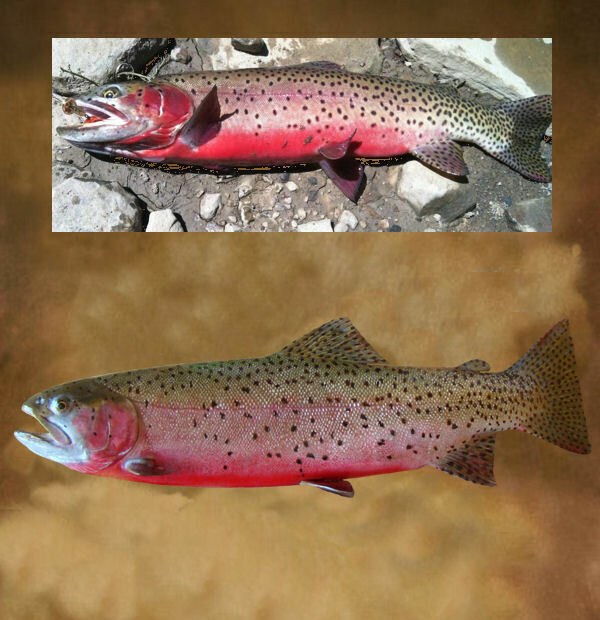 I have seen a trend toward fish replicas, some of which are quite good if the airbrushing/painting goes well. Are skin mounts now days able to retain accurate color long term? Some old specimens ( very old ...) discolor/stain. Thanks for posting this realistic, skillfully prepared and rarely seen mount. All fish are painted, skin mounts and reproductions. Skin mounts dry to a gray color with some pattern showing (darker scales), and need to be painted. Old mounts that have stains were not treated properly (fleshed & degreased). Once skinned and fleshed, I soaked in Dawn dishwashing liquid (degreaser) longer than I would on trout skins .... then I rinsed and soaked in white gas (Coleman fuel) for quite a while .... then rinsed and soaked into my zinc sulphate & borax solution (can stay in there forever). Here is a reproduction cutthroat. The blanks are solid white or gray depending upon the material used to pour the blank. Kerby, Thank you, we learned something. I marvel at your skill and patience, the painting techniques are amazing and your craft is amazingly realistic relative to that of our grandfathers. That cutthroat and the carp are amazing. I notice some items at the base of the carp mount, did you win a contest? 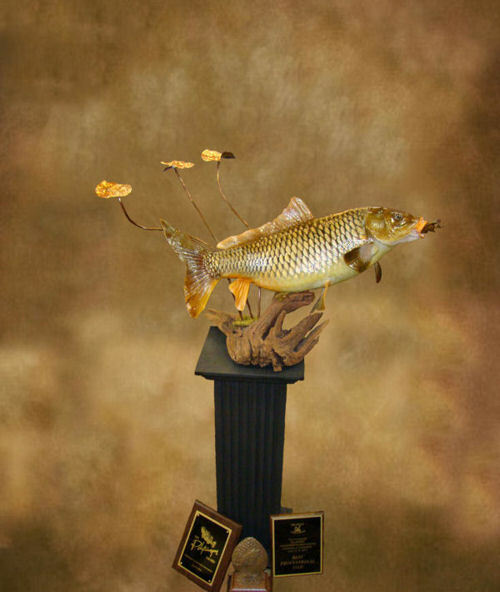 For those of us whom would like to have a fish mounted, how would you like the fish presented i.e. fresh or frozen, coated with ice, wrapped in cloth or plastic, etc.? How best should the angler care for the fish so the taxidermist can do their best work? One of the best anglers and taxidermists I know, Don Cameron, used to put a fresh caught steelhead and wrapped (it was usually cool/rainy NorCal) in a sheet; he tied like a hammock over the bed of his pickup. The fish never touched any hard object prior to him working on it. Last I heard he was wood carving fish, and experienced anglers say "they are gorgeous, they look like live fish, only better..."
Indeed your craft has come along way. Have you tried mounting Herps? There is a demand for them, and some of us are disappointed in much ballyhooed freeze-dry technique. You really have fish down! The best thing is to keep the fish wet (ccoler/livewell) until it can be put into a plast bag and in the freezer. For skin mounts it does not matter if the fish is touching something, but for reproductions it helps not to have dents in it, etc... Broken fins can be repaired. 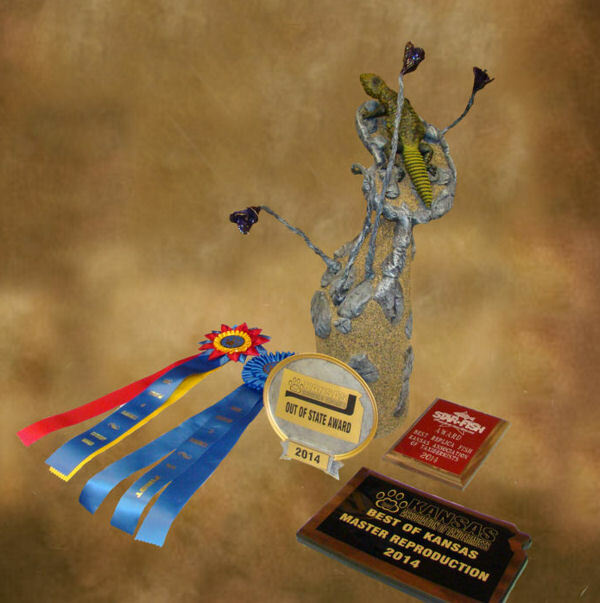 I do compete at different state shows, and the World Fish Carving & Taxidermy Championships. This piece was at the Oklahoma Show last weekend and I did win some awards as well as some of my other mounts. 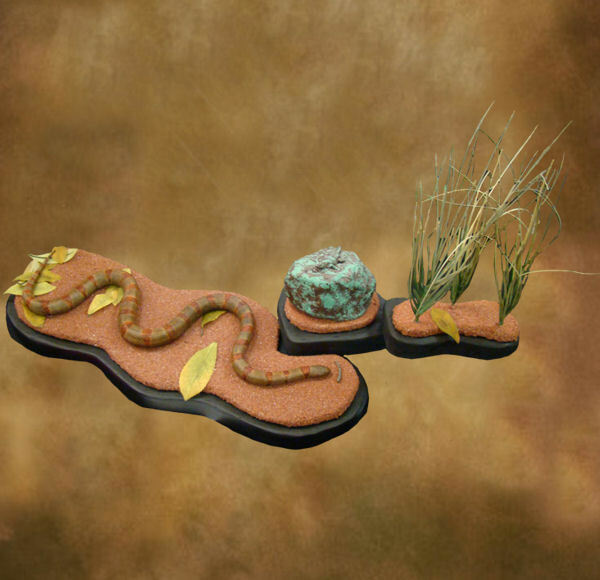 Here is a recent reproduction thayeri kingsnake (buckskin phase) that I molded, casted and painted. 2nd place Master Division at the Oklahoma Show (there were no 1st place ribbons). And here is a uromastyx lizard that I molded, casted & painted. It did well at the Kansas Show in March and at the Oklahoma Show last weekend. 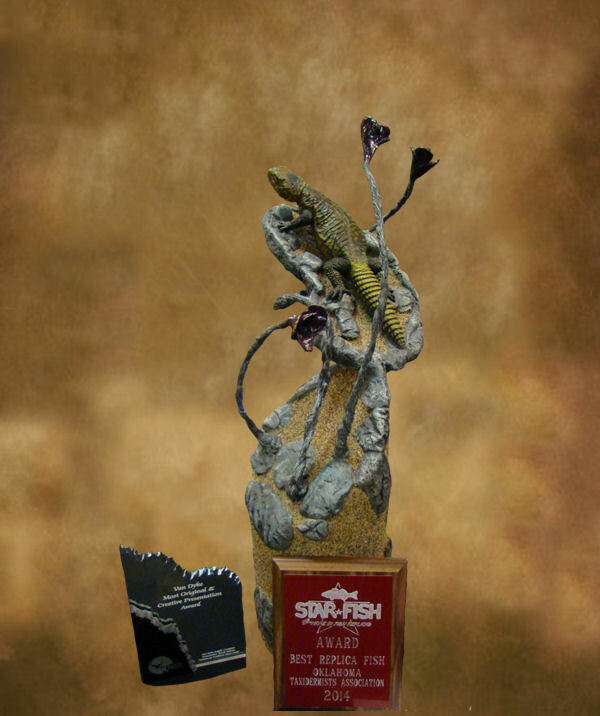 Highest scoring reproduction at both shows and other awards.